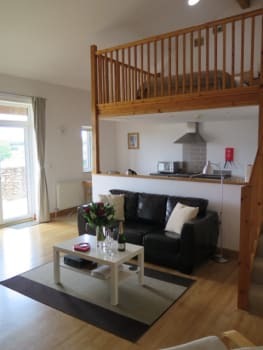 Our apartments give contemporary open plan holiday living and are available for short breaks from two days up. 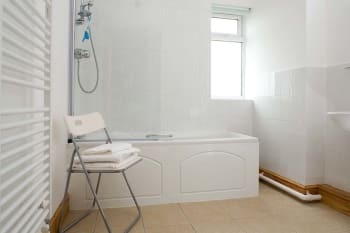 Light and airy accommodation comprises kitchen, lounge and dining area and mezzanine bedroom above with separate bath or shower room. 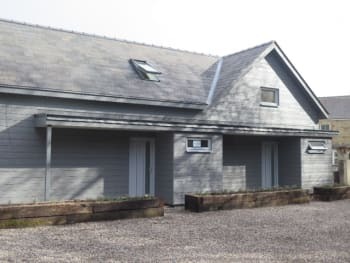 Double doors open onto the outside seating area that has fabulous views over the rolling hills to the rear of and guests also have full use of the adjacent guests' garden. There is ample off street parking at your door. A perfect base for walking (DOGS WELCOME), canoeing, wildlife, adrenalin activities, sightseeing and attractions, or just relaxing in this Area of Outstanding Natural Beauty. There are no rooms available at Symonds Yat Rock Lodge for these dates. Great location and the bed was super comfy. Great washing facilities for the dog, this come in handy! The tv is a little small on the wall, and maybe a selection of dvds would of been great. If you like walking and exploring then the trails opposite the lodge are a great start. Takes you right up to Yat Rock view point. The Saracens Inn at the riverside is a great spot for a bit of lunch and refreshments, the climb back up the steps is a killer but great way of burning off that food. Friendly hosts who were not overbearing but made themselves available if needed. So much to do in the area, lovely walks and cafes. Symonds Yat rock lodge is the perfect place to stay for a quiet holiday. It was so lovely and I couldn’t recommend it more. We will certainly be returning again this year and will probably make it our primary location to get away. There’s a guide in the lodge full of all the information you would need: restraunts, order in, places to visit, activities! The facilities were amazing, your luggage and food is really all you need. Thoroughly enjoyed our stay, thankyou. Outbreak of Bluebottles upstairs and couldn't find recycling bins, but otherwise superb. Just get out there, folks! Clean and comfortable, just big enough for a short break for two and two dogs. Really comfortable bed. Great location for dog walking. Great information about local amenities. We liked it so much that we booked again, though for a bigger unit. Brilliant for exploring the area, loads to do and see. Excellent location and property. A delightful stay. We had a lovely stay, booked at short notice - thank you! It is a lovely comfortable apartment. Our phones couldn't find the wifi network, but it didn't bother us so didn't ask. It's a beautiful area. There's some lovely places to eat nearby (we went to The Ostrich pub) and the walks through the forest and to the viewpoint are amazing and literally on the doorstep! High speed, unlimited wi-fi now installed. Lots of walking trails - walk from Symonds Yat to Monmoth, only takes 2 hours 20. Stunning scenery. A short distance from the Saracens Head pub - lovely food. We have stayed here a few times and decided to stay in one of the new apartments. The new apartment was really spacious with a large bathroom and bedroom, it was really light and very comfortable, our dog enjoyed having all the room to move around. Definitely worth a stay, we are going back again in February. The location is great you literally walk out the front door and the forest is on the opposite side of the road. You can walk from here up to Symonds Yat Rock which is lovely. Excellent location and the apartment is exactly what we were after. Views were stunning and we will definitely be coming back as soon as we can organise it! The New Inn pub about a mile up the road is an excellent rural pub with good pub grub and a warm friendly atmosphere. The recommended forest walks just over the road are a must, but allow plenty of time as they can be pretty slow going with the terrain. Hi Didn't meet any staff but all online dealings were excellent. Loved the lodge. Room was spacious and airy and well laid out. Kit - crockery, cutlery, electrics, wi-fi - all worked. Design of room made the most of the wonderful views. Also dog friendly which was why we selected initially. Excellent walks opposite the front door so ideal. Lovely,cozy little place, perfect location for walks. Met the owners as I was leaving who were both very friendly and overall lovely people. Would definitely go back and plan a few days out in the forest. The owners supply a file which is jam packed with leaflets and information on the surrounding area which was Very useful when it came to getting a take away :D it's amazing how much there actually is to do in the area considering it's location. Really helpful information pack - dog friendly info appreciated. Offer of items for the dogs also appreciated. Dishwasher seemed to have lost it's detergent door so we weren't able to use this, although not a major issue. A few dead flies found by window and in the shower light, didn't bother us, however, may put others off. 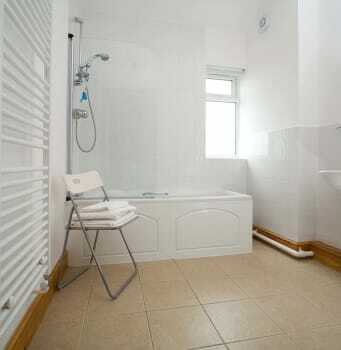 Lovely, modern apartment in a good, central location. Would stop again. A great place to stay with great accommodation and extremely dog friendly. Facilities for both guests and their dogs is of the highest quality. Fabulous views and instant access to the forest. Symonds Yat is only a short walk or drive away. There are plenty of activities for the more adventurous or just a great place to relax and enjoy the beautiful scenery. Take a trip on the river cruise, and enjoy the forest walks. Good pubs and restaurants to suit every taste are within easy reach. The accommodation was just right for a weekend stay and was in a great location, very central to any were wanted to go. Highly recommended and would definitely go again. If you have no sense of direction a sat nav (a working sat nav) is essential ha ha! Such a lovely location with beautiful views as you woke up, the facilities of the lodge were just perfect, everything you needed. Extra thoughts like the washing up liquid/dishwasher tablets/tea&coffee/ tea towel and kitchen roll was excellent so you didn't need to pack these things. 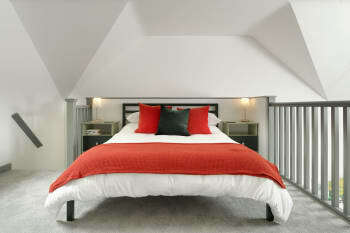 Beds were super comfy and jus loved the style of the lodges home from home. Found a lovely little country pub called the Dog & Muffler, food was excellent and the prices even better, it was very warm and friendly. We will definitely be going back. What a great place to stay. Excellent accommodation and having our dogs with us makes it the perfect place. Claire was very helpful and we stayed an extra night. Good restaurants nearby reasonably priced The apartments are well kitted out and the views great. Lots of things to see and do if you want to be adventurous or just the perfect place to relax and chill out if that is what suits you best. Symonds Yat close by and the walks in the woods make this a place to remember. Would certainly recommend it and no doubt we will be returning. We had a fantastic stay with our dogs. The lodge was immaculate and everything you needed was provided. We followed three of the walks which were perfect. This is the perfect location for walkers and dog owners. Claire and Darren were friendly and very welcoming. Thank you a great stay, we will see you again. We had a wonderful stay at the Lodge - the location was quiet, very scenic, and relatively easy to get to minus some steep hills coming past Symonds Yat. The starry sky in the evening was stunning - we could even see the milky way! Our only downside was that we couldn't connect to the WiFi - we were in House 1 so may have been too far from the router. The TV was also quite small and high up on the wall, so we used our laptop for watching things on. Overall, wonderful property, very clean, and nicely laid out. The hosts were polite and helpful and made sure we had everything we needed. They even included a huge folder of information, local events, activities, takeout menus, contact information, and so much more. Highly recommended. 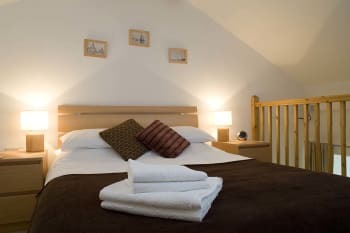 The Lodge is just up the road from Symonds Yat Rock which has stunning views, and some nice pubs down by the River Wye. Coleford isn't far which has Puzzlewood, Clearwell Caves, the Perrygrove Railway and more. Monmouth is also only a 15 minute drive, which is a lovely town with some nice places to eat. I highly recommend driving up to the Kymin (it's a steep winding path but worth the drive) which is a breath-taking view across the towns. Finally there are some lovely cycle routes in the Forest of Dean, and Tintern Abbey is a 20-25 minute drive that is well worth exploring. + We booked very late for this break so we counted ourselves lucky to get this booking. We were very impressed with the whole process from being confirmed to paying the bill. The access by using the last three numbers of your mobile is genius. The unit was just great and even accommodated my son ,his wife and three grandchildren when they visited for breakfast. It was very hot when we arrived and the Mezzanine was extremely hot. It would have been nice if the window above the front door could have been opened. Lovely stay at Symonds Yat lodge with everything you need! Beautiful view & in a great location, would definitely return! The Saracens head pub was a great restaurant on the river. Lots of great walks around the lodge! 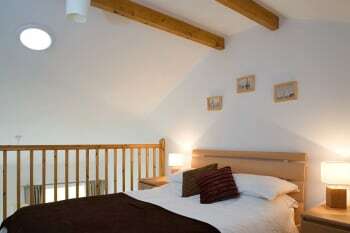 Great dog friendly accomodation in a superb location with walks from the door. Clean well equipped apartment. Due to the heatwave the mezannine bedroom was extremely warm air-con or a skylight would improve this. Do the Symonds Yat Rock walk and stop off for a coffee and homemade cake in the log cabin near the carpark. Lovely! Only issue we found was that it was difficult to sleep at night due to the heat upstairs, and that was with a fan blowing too! Definitely do some of the walks in the folder through the woods - absolutely lovely! A lovely location,very comfortable with every thing provided for your comfort.great views. The information pack provided was full of information as much as the tourist office. Lovely open plan accommodation with excellent facilities. Friendly and helpful owners, Claire and Darren on hand to assist if needed. Literally across the road from the Forest of Dean. Lots of walks from there and many other things to see and do locally. Lots of lovely places to eat around the area & we visited the New Inn, the Dog & Muffler & the Miners & all very good especially the Dog & Muffler ( great food & really good value!) Walks from the lodge good to the Rock & we liked Ross on Wye & Chepstow lovely places to visit. Excellent design of the new apartments. Great views, especially from the garden we opened out onto. Could do with a few more basics on arrival - tea bags and coffee supplied but no milk is a bit frustrating! The walk throught the forest over to the other side of the river is worth while. Especially if you can stop at the Saracens. Good food and great location. The Ostrich at Newland was also great. Very relaxed. 2nd visit and just as good as remembered. The apartments are very comfy and have everything you need. Location is perfect and the forest is just across the road. Will be back soon. Thanks to Claire & Darren for a lovely stay. The lodge is in a fantastic location and suited us perfectly for the type of break we wanted. It was nice to be able to walk to the places we wanted to see and not be driving everywhere constantly. For those walks, the instructions in the folder were fantastic - very clear and easy to follow and allowed us to enjoy our walks. The lodge itself was beautiful. Very clean and good facilities. 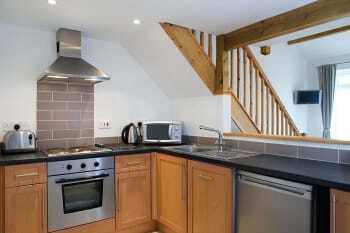 The kitchen had everything we needed which is quite uncommon in self catering accommodation. It was also nice to know that we were able to contact the hosts should we need to, but left us to our break if not. A fantastic break for us, thank you very much! We didn't try anything other than those walks/pubs recommended in the folder at the lodge, which were fantastic. Loved our stay here, it was perfect for a couple! Definitely Puzzlewood! Bike hire (pedalabikeaway) was also very good but check the weather forecast first! Very happy with our 2nd stay here at the Lodge. Everything my wife and I needed was here to make our stay a happy and comfortable one. 2nd time staying here and would definitely return again. Plenty to do and see relatively close by and even more if willing to travel out a bit further. We thoroughly enjoyed our stay. The view is to die for! The accommodation was perfect for our needs, a comfy bed, well equiped kitchen, piping hot water, and lots of little touches which make all the difference. For example, a hose to wash down the dogs. For dog owners it's a dream having the forest opposite. Buy fresh duck eggs from the cottage in the forest. We had wonderful time in Symonds Yat Rock Lodge. Amazing to wake up to the most beautiful and peaceful view. Clean, tidy and comfortable, most importantly, it’s so convenient to walk to the rock and the river. Highly recommended. Claire and Darren offer a fantastic location for a break. Always warm and welcoming and the facilities at Rock Lodge are meticulous for cleanliness and maintenance. We've been many times and will continue to do so. Well done and thank you. This is my fourth trip to Rock Lodge and I’ve always enjoyed it. The location is fantastic, especially with a dog as it’s right opposite the forest where there are beautiful walks through the forest. 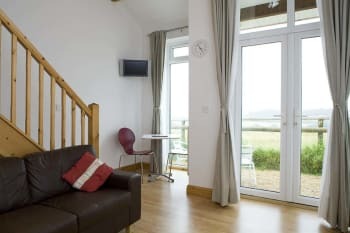 The lodges are perfect for a short stay, comfortable, clean and well equipped. The Saracens Head down on the banks of the Wye is a lovely pub serving great food with a great view, and The Boat Inn isnalso well worth a visit. Your in a great position for visiting some of the surrounding towns and of course there is Offas Dyke walkway which can be picked up in many locations. This was the second time we'd stayed at Rock Lodge. 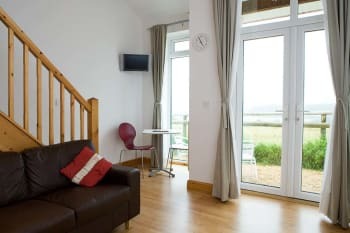 The apartments are ideal with great views and fantastic dog walking (with good pubs at the half way mark)! The location is great being just over the road from the Forest of Dean. The Dog & Muffler serves a great hearty lunch and is very dog friendly. Saracen's Head is friendly although we didn't eat there. Avoid Ye Olde Ferrie Inn at Symonds Yat West, the landlord and staff seem to resent having customers in the place! Nice easy relaxed place to stay. The walks down to Symonds Yat East make it. Wonderful location, apartments have all the facilities you require for a relaxing break. Dogs are very welcome and everything is nice and relaxed. The New Inn allows dogs and muddy boots! The location of Rock Lodge is superb for visiting the different centres in the Forest of Dean. We have stayed at Rock Lodge several times before and this time we have noticed how tired the rooms are looking and the outside of the building could do with repainting. The accommodation is satisfactory however if it was my apartment I would replace the tv with a large one as it is hard to read the guide because it is so small and so far away from the seating area. The only other comment I can make is regarding the kettle. Please look inside the kettle in apartment 1, this is in desperate need of replacing. When you look into it you will see why. The courtyard has also been reduced in size making you park away from your apartment. This we found was a pain especially when you have a lot of items to take from your car to the apartment. Excellent location, lovely views, just a few nightly items need addressing. Gem of a place in a beautiful setting. Didn't get to meet the owners but great communication from them. Please buy a new tin opener for apartment 4! Small, but well maintained apartment. Plenty of parking. Pleasant garden, lovely views and loads of walks straight from the front door - perfect for the dog. Very pet friendly. 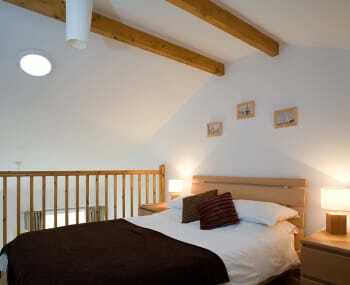 Lovely light & airy lodge but at the same time warm & cosy. Comfy bed. Beautiful view. Views of the countryside whilst inside & just outside the front door over the road is the forest. 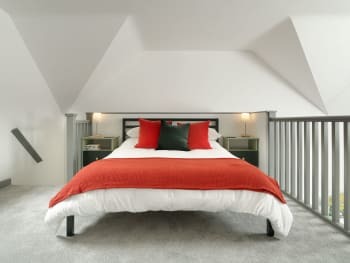 The lodge apartment is perfectly located for exploring the Forest of Dean with so many woodland trails on the doorstep. Very dog friendly place and we will definitely want to come back! Lovely accommodation.. Fantastic dog friendly place to stay for people who love exploring the area. Gave us a wonderful break from the city. It would be very much appreciated if a sachet of butter & some oil was also available. We will be back!! Canoeing, steam train ride, and always the forest is just across the road to walk in. Hobs on oven were *very* slow to heat up and never seemed to get very hot. No hot water on Monday morning. We had to cut short our holiday due to a bereavement and the hosts could not have been more helpful. We were only there 2 nights so did not really get to see much of the local area but to fully appreciate it you have to be fairly mobile. Amazing apartment, amazing views, peacefull, everything we were looking for. Just drive, so much to see within an hours drive away. The kymin has great views if you can manage the drive to the top! Great lodge ideally situated for walks in the Forest and to Symonds Yat. The Ostrich Inn (Newland) does great food and has a quaint traditional old pub feel to it. Truly wonderful stay - seamless check in, fully equipped, spotlessly clean and stunning views. The lovely fruit garden was a delightful extra touch. Location fantastic and walking distance to a number of excellent walks,pubs, restaurants and short driving distance to others. Can't say enough about the place. If you are coming to the area, stay here. It's idyllic. All described in the book in the apartment. We planned our stay around the contents. Nicely laid out cottages, very clean and well-equipped. Minor grumblings- no internet despite it being advertised (great to have a weekend off-grid but since there was a claim that there was internet access...) and the final bit of the directions could have been a bit clearer (description of entrance?) as we called into The Rock first by mistake! Walks around Symonds Yat are beautiful and very close to the cottages- no driving necessary. Puzzlewood also stunning. Rock lodge is a wonderful place to stay, amazing views clean comfortable accommodation. Ideally located to enjoy the Forest of Dean or Wye river. Two suggestions to make ones stay even better would be some kind of coat hanging rack, clothes drying airer in the room full time. (I did see in the notes they're available on request). Secondly there is only one decent sized saucepan two would be handy. Highly recommend the Saracens Head for a meal in Symonds Yat. The Wye river is a lovely spot for some kayaking & walking. Lovely, peaceful and relaxing stay. Wonderful facilities and fabulous views. Would love to come again. We loved visiting the Butterfly Zoo and one of our favourite spots to stop and eat lunch is the Taurus Centre. There are so many beautiful places to visit in the area and range of activities available for everyone's taste. A most enjoyable stay. Lovely accommodation albeit a bit hot. There appears to be a problem with the shower head not fitting in the holder. 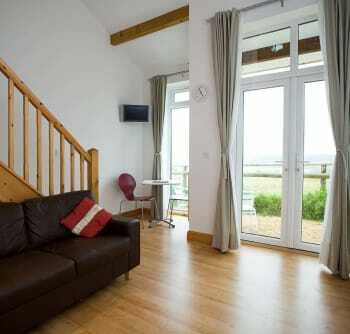 Well presented and equipped self-catering apartment with fabulous views. This was a lovely place to stay, a nice quiet location the wood was just across the road. We had lovely views with lots of amenities close by. The accommodation was of an excellent standard. The new inn pub is a mile up the road, the food was excellent & always piping hot, it also had a lovely atmosphere with friendly staff. Couldn't fault the apartment(number 8)or the location.The views from both inside and out are stunning and you can walk for miles in the forest starting across the road.The only negative is the lack of WIFI. It can be received by the dining room and out front of complex.A few simple boosters would overcome this problem but other than that I can't say anything else bad about the place.....because there isn't anything bad about this place. If you like walking in forests,then this place is for you. If you like watching/listening to sheep,this place is for you. if you like just relaxing,this place is for you.....in fact I'd say no matter what,this place is for you. There is a town about 5 mins drive away with a large Co-op and other shops along with a couple of take-aways.If you're self catering this can be quite handy...as we found out. Really nice little apartment. Perfect location. It was also spotless very clean! Great that you accept 4dogs esp. With no charge. 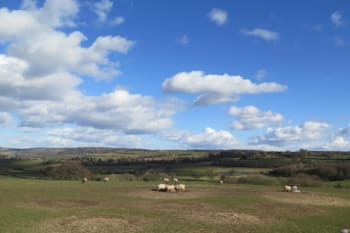 Amazing views loved seeing the lambs from lounge. Only a few small negatives TV was a bit small, from distance sat on sofa wasnt that easy to see. Larger bath towel would be handy for after shower to walk back up to bedroom. Sofa v comfy but quite small for 2 adults maybe a separate chair as well. Although great 4 dogs allowed could do with a toilet area for them! Handy forest just over the road but when its dark somewhee closer ideally needed. Beautiful view, lovely clean room. Great location as right next to the forest and an enjoyable walk to Symonds Yat. We would happily stay again. The only very minor improvement is that the towels provided smelt very musty. Excellent accommodation set up and so dog friendly. An excellent area for walkers, nice to be able to walk straight from accommodation, not have to worry about the car. Some excellent pubs locally serving great food from local produce at reasonable prices and some giving discounts if staying in local area. Lots of dog friendly pubs in the area, the new inn were very welcoming. Lovely location. We were the only ones there during our 4 night stay so the whole place was very quiet. Accommodation was excellent, but as in previous reviews, Wifi was non existent even in residents garden where it's supposedly better. Makes using phone for local information etc impossible. Fridge had been turned off, so on arrival with food for our self catering break, there was no where to keep it cool for a few hours. Despite these issues, we would go back, beautiful area & fantastic walks. Some great dog friendly pubs but unless it's Summer & light til late, they're a taxi ride away. Saracens head lovely pub/restaurant day & evening Symonds Yat walks in Forest and woodlands Increase your cellular browsing limits as no wifi Eye mask if you don't want to be woken when it gets light early. Excellent location and very friendly couple who run the B & B and self catering apartments. Very scenic and only a hop skip and jump across the road and your in the forest. Deer were on the edge of the forest in the mornings. Walked along river to Monmouth. Got bus back to Staunton and then walked down through forest to campsite and then along the edge of the woods back to Rock Lodges. ( Avoided big climb back up on way back) Peregrines are great to see at Symonds Rock in the summer. Be aware that the river ferry from the Saracens Head doesn't run if the water level and river is fast flowing in the winter. Arrived to a clean apartment with a nice view of the countryside out the back. WiFi isn't great but roaming data came up as 4G which is better than nothing. Overall was a very enjoyable stay. Very nice place to stay with lots to do near by, would definitely come back again in the summer to try kayaking/canoeing. New Inn - within walking distance, great local food and they allow muddy boots and dogs! Fabulous stay, made very welcome. Well equipped and helpful owners. Lovely staff, very friendly and welcoming! Would definitely recommend to others. We really enjoyed our stay. Great stay, great value. Would definitely come back. We stayed in one of the little self catering apartments. They are furnished and decorated to a high standard and the views out of the patio doors at the back of the apart are fabulous. Unfortunately we didn't get to enjoy them much as we were too busy out walking and enjoying all the surrounding woodland and river scenery. Great location, walking distance from a few pubs and very welcoming owners. Would highly recommend. Take a torch and do a recce in daylight if you plan to walk to pubs through the woods. A torch is provided in the apartment but I'd advise taking a very good / powerful one with you. 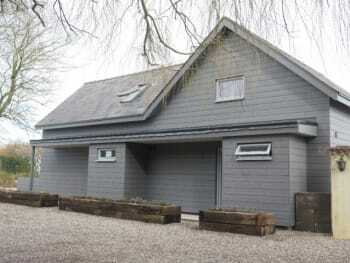 The location is great, immediate access to the forest and then the wye by foot. It is secluded and has great valley views. The accommodation was excellent, clean and spacious. the nearest pub is a mile walk, new inn, book a table at the weekend. long uphill back from Saracens head, take a torch if late. Excellent self-catering facilities with a glorious view to the rear. Owners are always helpful. Third time we've stayed now. Highly recommended. comfortable.Spacious. Lovely view. Friendly staff. A modern apartment style which we found comfortable and quiet for a relaxing holiday. The facilities provide for self catering and for a special treat we enjoyed a fine meal at The Bell at Skenfrith. The main route to Tintern Abbey is a lovely scenic drive as is the Golden Valley route to Hay. And you have Symonds Yat on your doorstep and can walk from the lodgings if you want a rest from driving. Everything was as lovely as last time we visited,but as the weather was hot it made the sleeping area very warm at night. Perhaps a fan could be supplied for these quite rare occasions! Good walk and meal at the Dog and Muffler, Joyford. Also the Saracen's Head at Symonds Yat. In Hereford, the Antique Tea House did a very good lunch. Also carry a small pot of aloe vera gel for emergency treatment for stinging nettle encounters! Lovely clean well equipped apartment. Easy walk to Symonds Yat. Great views. Lovely place to stay in all respects. Everyone was helpful and supportive, if you needed anything but also respected your privacy if that is what you wanted. We would stay again without hesitation. Thank you. Canoe trip on the River Wye. Sculpture trail. Meals at the Saracen Head along the riverside. Visits to the Dog and Muffler and the New Inn. Lots of wonderful walks in the Forest of Dean. 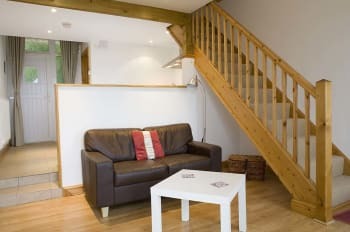 The self catering apartments are gorgeous! Extremely friendly and helpful owners, conformable accommodation. Well equipped but hanging space for wet coats would be useful. Had a lovely relaxing stay. Facilities were great and will definitely go again. The only slight negatives were that the light wells in the bedroom area couldn't be covered and were rather bright in the morning, and the mattress had a ridge down the middle which made you roll to the edge of the bed. Apart from those minor things was excellent. Lovely place to stay ...we were banking on wifi and couldn't get it! Very nice, friendly location to visit the area. Great views especially for breakfast with the morning sun! Great little place. Wonderful views and great facilities. Definitely be going again. 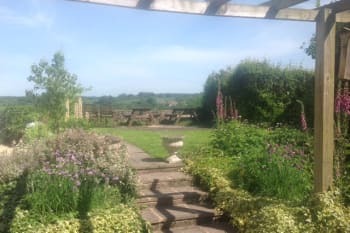 A quiet, peaceful country hideaway complete with beautiful views and forest walks on the doorstep, or longer down to the river Wye threading through its lush, green valley, or shorter to the Rock with the famous and always wonderful view. What could be better? 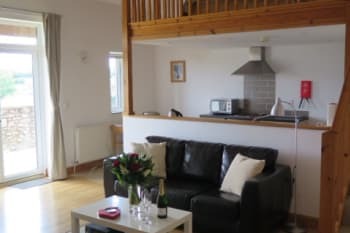 Throw in this lovely self-catering apartment, clean and modern, with everything I needed (except a bath to soak in after the day's exertions, though I think the larger apartment has a bath) and I'm feeling completely at home. Darren and Claire are lovely, warm and friendly people who couldn't have done more to make the stay perfect. I found the suggested Symonds Yat Rock Lodge walks are reliable and accurate. Great apartment with good facilities. Great location to explore the area. Would expect the side access to have a secure barrier so dogs can't run out into the car park / road. (Accepting that space was restricted) we didn't like the fact that we didn't have an enclosed area outside each apartment so we could have the back doors open without losing the dog. Luckily the people and 90 percent of the dogs were dog friendly. Claire & Darren were very welcoming and helpful. Absolutely beautiful location. Visit the Dog & Muffler at Joyford, lovely walk to get there too. The Boat Inn at Penallt - Beautiful setting, quaint pub and good food. Very welcoming. When they knew we had arrived, our room was prepared and ready before our check in time. We stayed in Room 5. The sofa is not very comfortable and needs replacing, also the mattress was a little lumpy. Otherwise a lovely stay as usual (this was our 3rd visit). We are now regular visitors to this venue. This part of our country is beautiful, and this area is well supported overall with numerous variety of outdoor activities. Excellent apartment and location. Felt like a home from home as they had thought of everything. Do the walks on the maps inside the room especially Wye valley then up onto symmonds yat Rock for the amazing view. 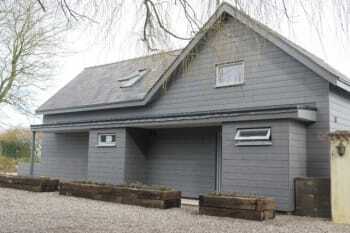 Accommodation was finished to a high quality and very comfortable for 2 adults and 1 dog. Full kitchen and comfortable bed. Also the book in the accommodation with details of local pubs that accept dogs, walks in the forest and visitor attractions was very informative. We will definitely visit again. The New Inn is in walking distance, instructions in the book in the accommodation, they accept dogs in the bar area and serve delicious local food. 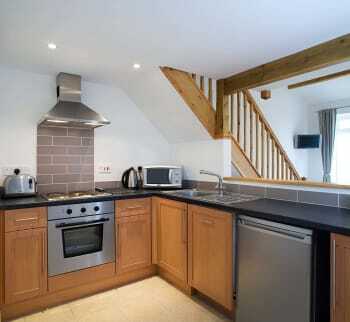 Really well presented apartment, ideal for both relaxing and as a base for exploring the Forest of Dean and Symonds Yat. Take a night off from your self catering and take a short walk to the New Inn for a lovely evening meal. The Forest is right on your doorstep, enjoy exploring the many paths and try to end up at Symonds Yat East where you can reward yourself with a riverside pint at The Saracens. Thank you for a lovely week. We will definitely be back to stay again as the room and view is amazing and for 2 years running we have had a lovely time. Great location, made to feel welcome. Lovely views from apartment good for walking into valley/forest. Pet friendly. Cosy. A wonderful find and a definite home from home, clean, tidy and all to a high standard. Met on arrival with a big smile and shown to our apartment, took in the view and then went for a stroll around the local area. Fantastic and now looking to plan return trips! Thank you. The information pack provided was excellent and you will find something for everyone. Whether walking, driving or cycling there is plenty to see and do in the local area, or just sit back and relax with a book admiring the beautiful countryside. Owners very helpful and friendly. We just love walking in the local area. We find it very relaxing and a lovely break from caring commitments. The only thing I was not comfortable with was the low ceiling height above one side of the bed. 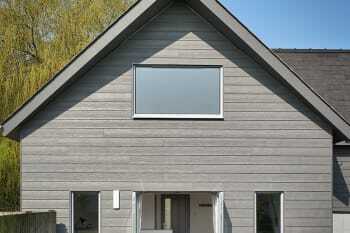 A Velux window enabling you to see outside and open for fresh air would transform the space, otherwise I cannot fault it. The Saracen's Head, by the river, for good food. Nature in Art well worth the visit.